Twizzlers (yum… Twizzlers) may be vegan, but that doesn’t mean I should partake in them. I’ve been thinking about them lately because they are quite possibly my favorite non-chocolate candy, and I bought a huge bag of them before Halloween. At least I know what I’m getting when I eat a grape or carrot or pear. 1. Opt for products with less ingredients. 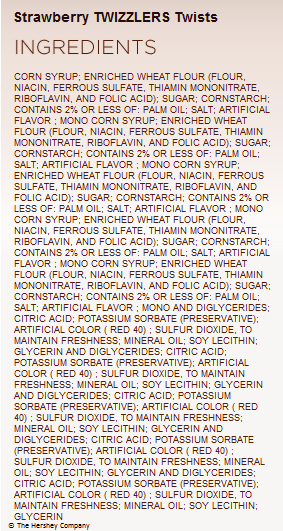 When the ingredients list takes up half the package, it’s probably best to put it back on the shelf. 2. If you can’t pronounce the ingredient, you probably shouldn’t eat it. Part of me does celebrate the fact that I can indulge in Twizzlers and not feel like I’m breaking any vegan laws. The other part of me knows that, vegan or not, Twizzlers should stay on the shelf and out of my body. Know what else is vegan? Oreos. YES!! I did know that!! I smash ’em up and mix them in with coconut milk ice cream.